Major partnership announcements make it clear collaboration is the way forward for IoT. I have long been fascinated by the workings of ecosystems. Last week’s Arm TechCon in San Jose was a textbook example of how ecosystems work, overlap and how the electronics development work is indeed like a village—it takes many players to make things happen to enable end users to receive the latest gadgets like phones, fitness trackers, electronic watches, etc. The game of electronic ecosystems has never been as active and transformative before! 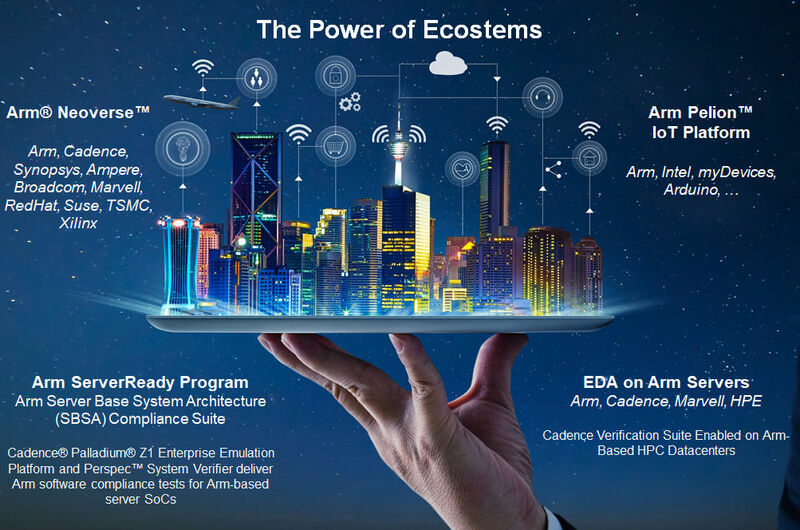 My fascination of ecosystems led to previous blogs like “The Game of Ecosystems,” “Top 7 Verification Trends For 2017—Changes In The Game Of Ecosystems,” “Embedded World 2018: Security, Safety, And Digital Twins.” Last week’s announcements at Arm TechCon took ecosystems to a whole next level. On TechCon Tuesday, everyone was talking about Monday’s announcement of the Arm Pelion IoT Platform ecosystem’s “any device, any cloud” strategy, and how it was strengthened by strategic partnerships with Intel, myDevices, and Arduino. At its core, the partnership with Intel includes the capability of “late binding” to a cloud. Instead of hardcoding into an IoT device which cloud it connects to, the device can now dynamically and securely discover the target cloud it is talking to. The partnership with myDevices is about simplifying device onboarding and increasing the number of sensors, gateways, and solutions integrated with the Arm Pelion IoT Platform; developers can try out Pelion services together with myDevices’ IoT in a Box for only $199. Finally, Arduino is also partnering with Arm’s Pelion Connectivity Management to give their users the option of competitive global data plans to suit everything from single IoT prototypes to production IoT deployments. Then on TechCon Wednesday, it was all about what Arm calls “infrastructure,” combining networking and servers. The Arm Neoverse was dubbed as “the modern cloud-to-edge infrastructure foundation for a world of a trillion intelligent devices.” At its core, the announcement made on Tuesday was about Arm’s new IP for 5G networks and next-generation cloud-to-edge infrastructure, specifically “Ares” (7nm), “Zeus” (7nm+), and “Poseidon” (5nm). The announcement came with 11 ecosystem quotes from EDA vendors like Cadence, developers of server and networking chips like Ampere, Broadcom and Marvell, software providers like RedHat and Suse, and technology partners like TSMC (process) and Xilinx (CCIX). All this comes with an infrastructure developer community as well. Finally, as evidence that we are “eating our own dogfood,” we also announced jointly with HPE, Marvell, and Arm that the Cadence Verification Suite is enabled on Arm-Based HPC datacenters. Our tools run on x86 and Arm architectures. So, bottom line, the game of electronic ecosystems has never been this active before. In the IoT space, companies are forming partnerships while actively competing in the infrastructure space. It takes a village to enable all this, from process technology though EDA, semiconductor and software providers. All for us to be able to get the latest phone, fitness tracker and other gadgets, and allow them to work together. We truly live in exciting and transformative times!